Meadowcroft offers various activities to scout groups of all ages that provide an entertaining and educational experience. As a museum focusing on the anthropological history of the tri-state area we are well suited to teach the material for badges covering the cultural history of our region. As a rural institution, we are also devoted to preserving the natural resources of Meadowcroft, allowing us to provide material for natural history and environmental requirements, activities, and interests. Meadowcroft also provides our standard education programs for scout groups. These provide an ideal way to get younger packs an educational outing that they will all enjoy. They can be utilized in the various, “visit a museum” or “learn about people” of the past requirements for early scouting activities. Meadowcroft does not supply blue cards or badges/pins/belt loops that are earned during our programs. A Meadowcroft patch is available for purchase in the gift shop, but is not included in the program fee. Scouts are responsible for providing their own handbooks, notebooks, journals for recording information when requirements dictate. We suggest bringing meals to any all-day programming. The gift shop has only chips, drinks, and other light snacks. There is a minimum of 10 scouts for any educational programming unless otherwise specified. At least one chaperone is required for every 10 scouts doing educational programming. Badge requirements that will be fulfilled as part of the program are listed for each. Additional badge requirements may need to be completed by scouts on their own using the information provided on their visit. A certified counselor will sign off on all requirements completed during the workshop. Please fill out an Scout Program Request Form with your information to request a program at Meadowcroft. Scout service projects may be available. Contact Andrew Donovan, education & program manager, at ardonovan@heinzhistorycenter.org or 724-587-3412 for details. Requirements: 1, 2, 3, 4b, 4c, 6, 7b, 8c, 9b, 10a, 11. While participating in the Boy Scouts of America Archaeology Merit Badge program at Meadowcroft, scouts will visit a recreated Monongahela Native American village, the Meadowcroft Rockshelter archaeological site, and participate in a mock-excavation. Over the course of these activities, the majority of the Boy Scouts of America Archaeology Merit Badge requirements will be met. To facilitate a better comprehension of the material covered during their badge day, Scouts must complete a 2-page packet [download] before coming to Meadowcroft using the BSA Archaeology Merit Badge Pamphlet. Scouts should bring their completed pre-work sheets and a blue card on the day of the program. Some requirements are to be completed independently using the knowledge gained from the Meadowcroft Archaeology Merit Badge program. A complete agenda of this intensive badge can be found here. Requirements: 1, 2c, 2d, 3a, 4f. Under the supervision of BSA certified Indian Lore Merit Badge Councilors, your scouts will spend the day completing all the requirements set forth by the Indian Lore handbook by visiting three of Meadowcroft’s exhibit spaces. Throughout those exhibits, scouts will learn that cultural exchange wasn’t just a one-way street. There were numerous cultural attributes adopted from Native Americans throughout the post-contact period which resonate into today. 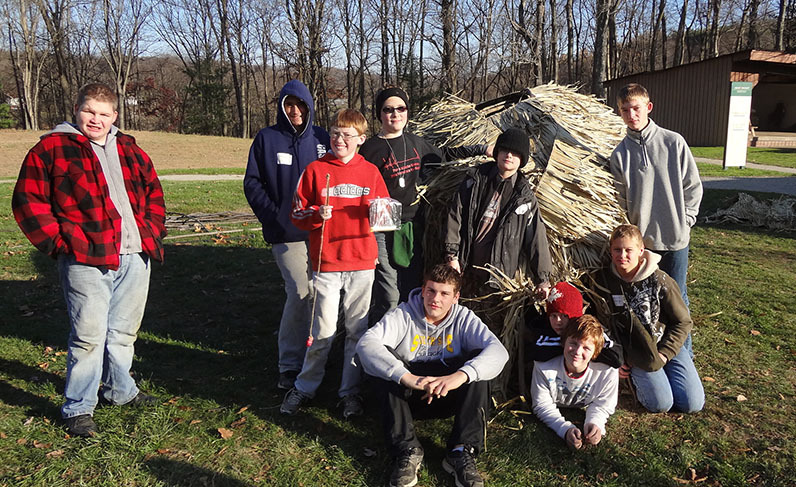 Scouts will receive an in depth look at the Iroquois confederacy, work together to build a 6′ model of a traditional Wigwam, and receive a lesson on the basics of artifact identification used by archaeologists around the world. As a part of their admission fee, scouts and their families will also be able to visit the Meadowcroft Rockshelter. Cost: $10 per scout; 2 chaperones for every ten scouts are free. Meadowcroft’s setting in rural Washington County makes it an ideal place to study the natural world. On a staff led walk through the museum grounds scouts will learn about the effort that it took to turn Meadowcroft from an abandoned strip mine into a thriving woodland ecosystem. We’ll identify and discuss the native and invasive plants chosen to take on the task of the reclamation, and their importance to the continued health of our woods. Webelos Elective Adventure: Into the Woods: 1, 2, 3, 4, 7. The Meadowcroft Rockshelter is a geologic feature that provided shelter to humans as far back as 16,000 years ago! Because our archaeological site owes its very existence to geology, we have developed a passion for the subject! This program will teach your scouts all about rocks, how to study them, and their impact on humanity. During a trip to the archaeological site scouts will learn about the 300-million-year history of the sandstone formation that makes up the Rockshelter; how the stone was formed and the erosive forces that carved out the overhang. Scouts are also invited to bring in their five different rocks to identify with our knowledgeable staff using Mohs scale of mineral hardness. After the scouts have completed the program, they will have all the information that they need to perform the various discussions and investigations set forth by the Cubscouts Webelo Handbook. By the time scouts leave Meadowcroft they will never look at rocks the same! Webelos Elective Adventure: Earth Rocks! : 1, 3a, 3b, 4a, 7a. Cost: Camping fee is $10 per person. Are you looking for an agreeable place to introduce your young scouts to the wonderful world of camping? Meadowcroft Rockshelter and Historic Village offers camping opportunities for scout groups during which scouts can successfully complete the list of requirements for a number of Camper badges. Overnight stays on our green are available as an addition to any of our programming at the rate of $10 per person (chaperones included). Mandatory 1 leader for every 5 scouts. Vehicles are not permitted to drive on grassy areas. Staff Only areas of the museum grounds should be respected; access to historic areas is prohibited after business hours. No alcoholic beverages are permitted anywhere on the premises.